You CAN have the Bible taught on your high school campus, as an elective, during school hours, for credit, with the Bible as the textbook. Want to know how to get this in your local school district? 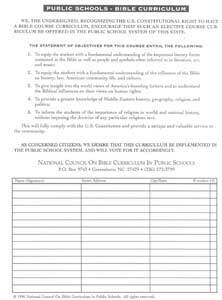 You can also make copies of this petition and start getting students signatures. 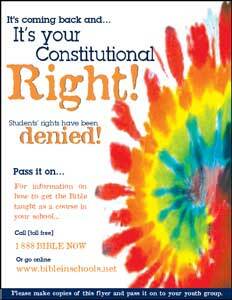 Be sure to check the box marked student and call us to find out how many signatures you will need.